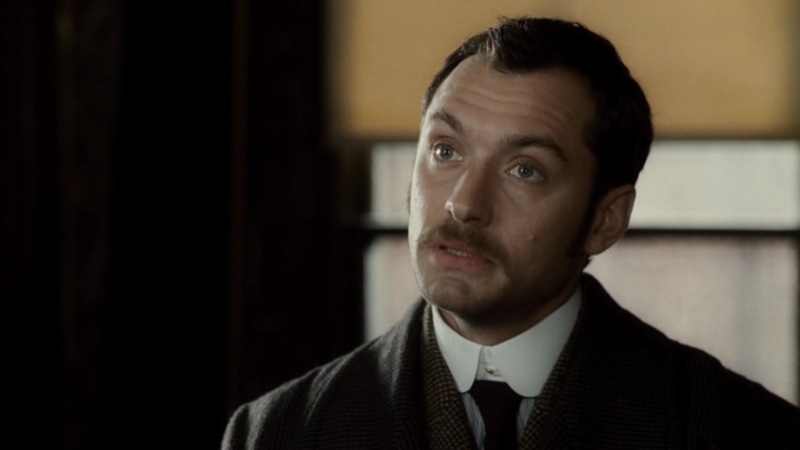 Jude Law as Dr. John Watson in Sherlock Holmes (2009). While the current British series Sherlock offers more universally adaptable wardrobe options due to its contemporary setting, I unfortunately have yet to see the show (which I know I will love) or own it on a screencappable medium. 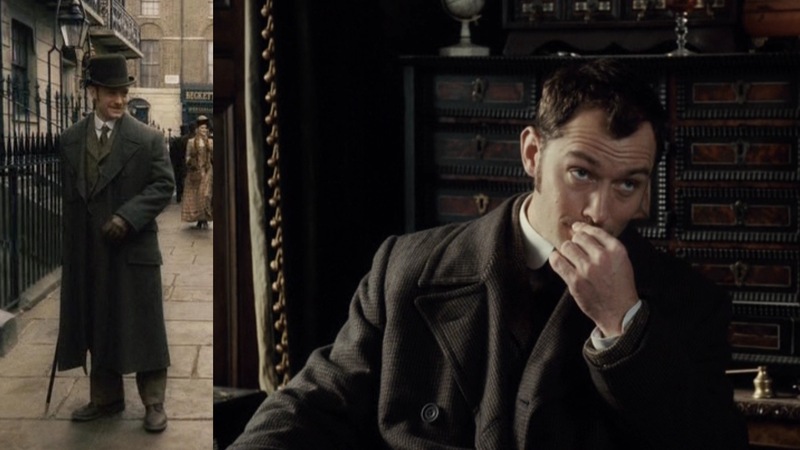 Thus, to celebrate Sir Arthur Conan Doyle’s 155th birthday this week – May 22 – I’ll be offering a suit worn by Jude Law in the 2009 adaptation of Sherlock Holmes. Dr. John Watson is the second-greatest invention of Conan Doyle, forever influencing the “active narrator” present in mysteries and thrillers. Throughout the years, Dr. Watson evolved from Conan Doyle’s stoic if somewhat stodgy man of action into a total dolt whose friendship with Holmes was the only thing keeping him alive. 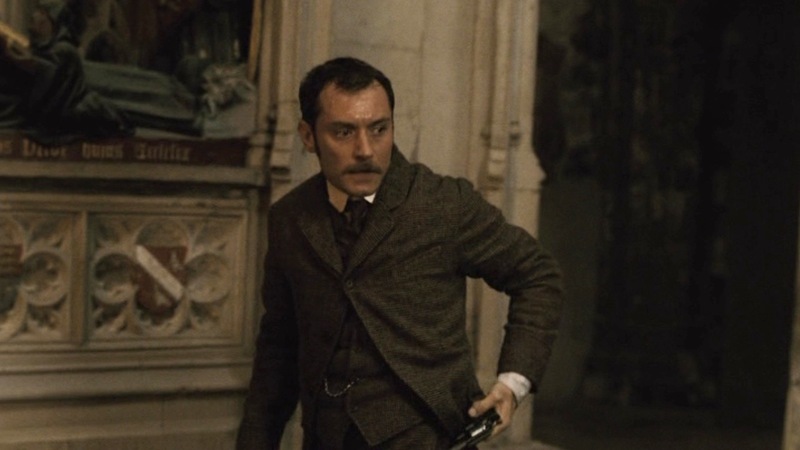 When Guy Ritchie reinvented the series beginning with his 2009 film starring Robert Downey, Jr. as the titular Holmes, Jude Law portrayed Watson with the same intelligence and reluctant enthusiasm for solving crimes that was found in the original books. Ritchie and Law reintroduced Watson as a man of action rather than as a man distracted by shiny objects. Prior to this, the only other Watson portrayal I really was able to enjoy was James Mason in Murder by Decree. 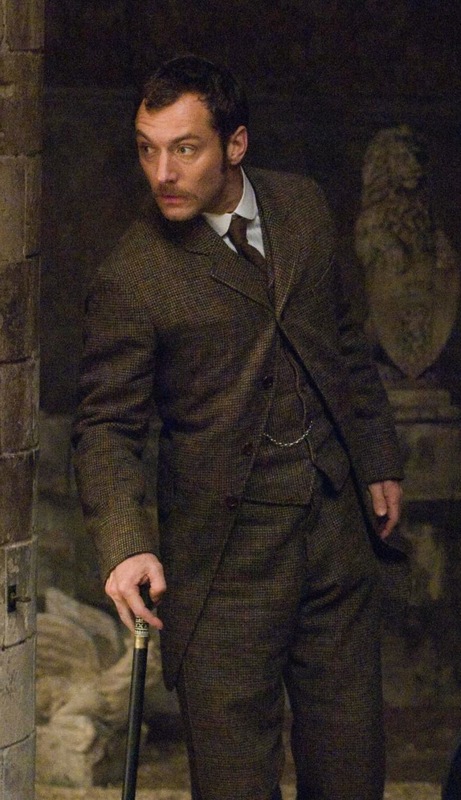 At the outset of the film, Holmes and Watson team up to catch Lord Blackwood in the midst of his nefarious deeds. 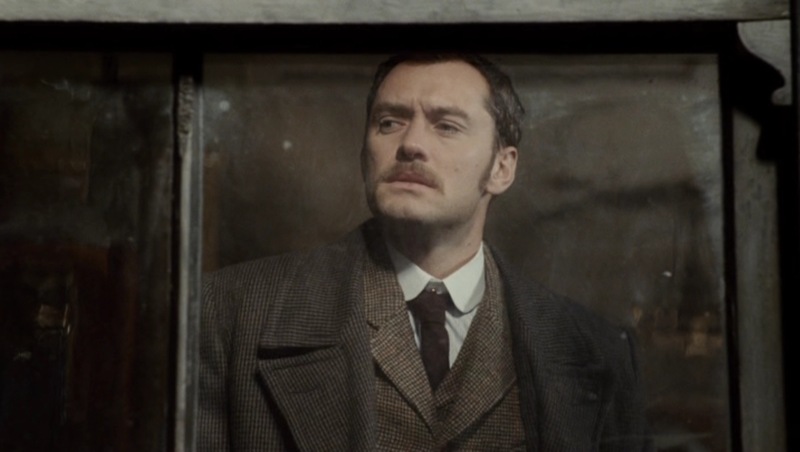 Before the credits even roll, Holmes and Watson have placed Blackwood in the questionably safe custody of Inspector Lestrade and have racked up yet another success. While “No Brown in Town” was still the going rule in 1890 London, this is a special instance of Watson going on an undercover adventure after dark. For this mission, comfort and concealibility are key. However, unlike Holmes’ more ragtag attire, Watson adheres to the conventions of the period by donning a three-piece suit, coat, and hat. Watson sports the perfect example of a Victorian gentleman’s country suit. It is a brown Harris tweed houndstooth check comprised of a dark brown and light brown check with red threading throughout. 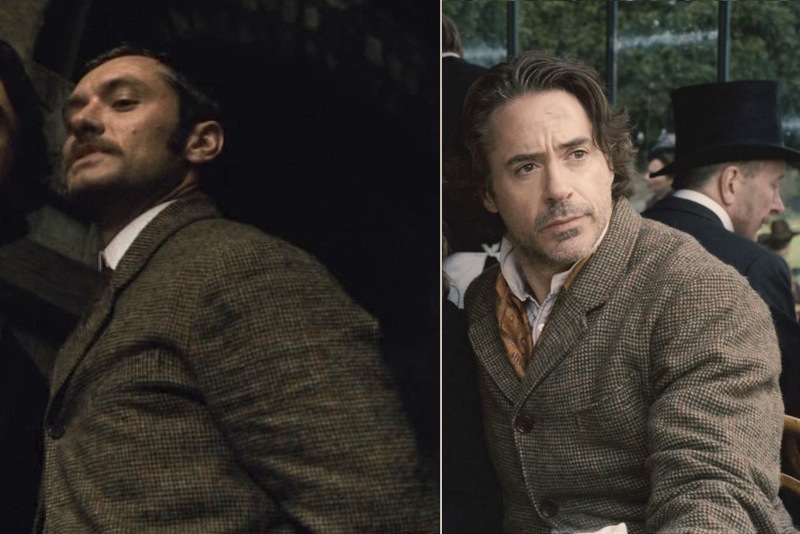 Interestingly and in a nice nod of continuity, Sherlock himself wears the same suit in the sequel as he and Watson are crossing from England to France on the ferry. This choice is especially considerate since Sherlock would have no other clothing (having previously been dressed as a woman) and would thus need to borrow something from Watson’s baggage. Although, naturally, Holmes offers a more Bohemian-styled accompaniment. The jacket is a long single-breasted lounge coat with a high-fastening 4-button front that he wears buttoned “Richmond-style” with only the top button done. All of the buttons are dark brown horn, including the 3-button cuffs on the cuffed gauntlets. Watson’s jacket has notch lapels that roll short to the top button. The lapels not only have large rounded corners on the notches but also a button-fastening collar tab. Dr. Watson and a patient. The rear of the jacket has a long single vent and five back seams with two decorative buttons. The decorative buttons are a callback to the days when gentlemen would ride horseback and would need to fasten their rear jacket flaps to the waistline of their coat to keep them from flapping about annoyingly while riding. There are three outer pockets. The welted breast pocket slants down toward the center of the jacket. There are also straight pockets on each hip with wide flaps over the top. The combination of the angle and Watson’s Richmond-buttoned jacket makes him look really tiny here. Watson’s matching suit vest (or waistcoat, since he’s British) is also single-breasted with six buttons down the front. All six buttons can be fastened, since the lowest button is above the cutaway notched bottom. It has notch lapels to match the jacket. The light brown silk lining has an adjustable rear strap and matches the suit jacket’s inner lining. The waistcoat has two welted hip pockets. Watson wears his silver open-face pocket watch in his right pocket with the silver chain stretched across his vest. Watson checks his Bulldog revolver. Note the red threading in the suit tweed. Watson’s suit trousers rise high on his waist and are ostensibly worn with the same brown leather suspenders/braces that he wears through the rest of the film, fastened to the fishmouth rear with an adjustable tab. These suspenders have gold-colored adjusters. The trousers have a flat front and a straight front button fly. There are two pockets that open straight down each side seam and no rear pockets. The bottom of these trousers have cuffs (turn-ups). Watson wears his signature brown boots in this scene. They are a pair of balmoral plain-toe half-boots with a laced front. Watson, about to make a nearly-fatal mistake. All of Watson’s outerwear and accessories are various shades of brown, continuing the motif of the rest of the suit. His first coat is a light brown slip-on topcoat with large notch lapels, and a 3-button single-breasted front. This is the same coat that Holmes borrows when he goes chasing after Irene Adler three months later. 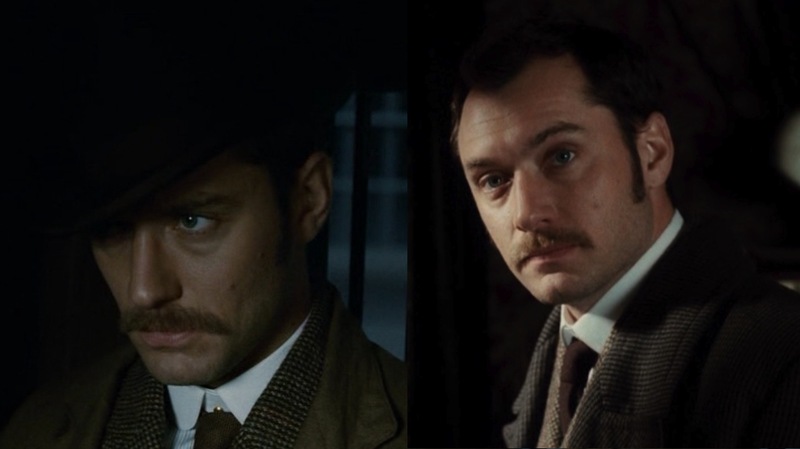 Evidently, Holmes has quite a habit of borrowing Watson’s clothing. The coat has slanted patch pockets that close with a flap over each hip, no cuff buttons, and a long single rear vent. It is an appropriate coat for Watson to wear in August in London since it is lightweight and unlined, as evidenced by the unstructured shoulders. Holmes and Watson prepare for battle. A few months later, when battling the cold of November or December after the completion of their adventure, Watson wears a heavier dark brown houndstooth full length paddock coat, a very fashionable option for gentlemen in colder weather. The coat is double-breasted with a six-button front, two flapped hip pockets on each side, a long rear single vent, and no cuff buttons. He accompanies the coat with a pair of dark brown leather gloves. Like a gentleman, Watson removes his hat and gloves when indoors. The check is dark brown and brown, resulting in a darker overall appearance than the suit underneath it. Both in the opening and closing scenes, Watson wears his brown Coachman’s bowler hat with a brown band. The Coachman hat is similarly styled to a top hat, but it is far less formal and presents a more masculine, squared alternative to the common derby hat of the era. It is a very appropriate choice for a military gentleman like Watson. The Coachman’s hat also gives Watson a few extra inches of height when his fiancee is standing two stairs above him. Watson’s favorite shirt is evidently a striped shirt worn with a white detachable collar. The shirt itself has a white ground, and the stripes are very thin brown and blue pinstripes. The shirt has a front bib placket with white buttons and rounded cuffs that close with a single button. His detachable collar is a white club collar, now referred to simply as a “rounded collar” by those less in-the-know. The collar is fastened to the shirt with gold metal studs on both the front and back of the collar. He wears brown woven neckties in both sequences, fastened with a four-in-hand knot that hangs just below the shirt collar. The second tie – in the finale – appears to have some red woven into it as well. Watson on a misson (left) and retrospective (right). 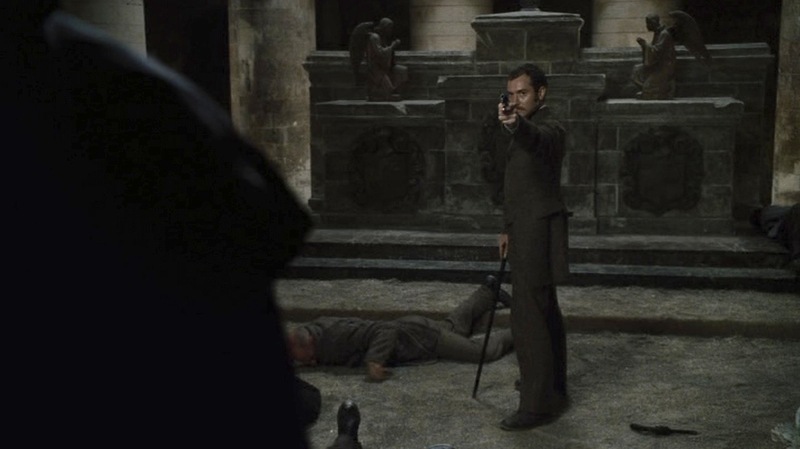 While Watson is both a BAMF and a man of action, he still needs Sherlock in order to see the forest for the trees… or a clear glass sword that Lord Blackwood nearly uses to take out Watson’s eye. The two banter while fighting, giving the audience a fine introduction to the mood of the rest of the film. 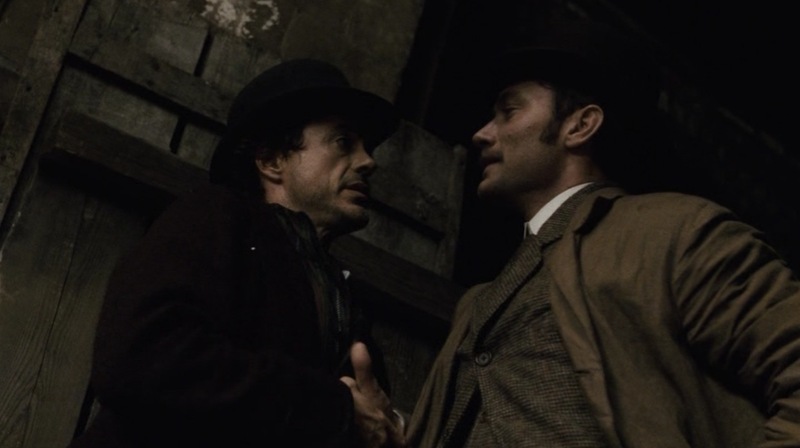 Dr. Watson: (to Sherlock after putting a henchman in a chokehold) I like the hat. 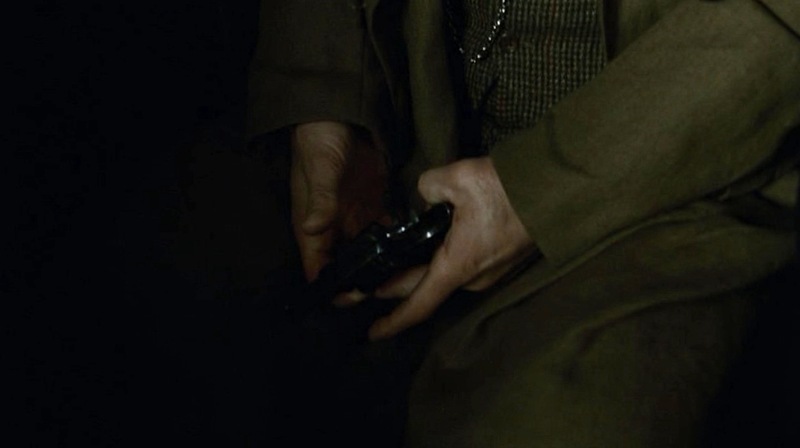 Sherlock: Thanks, I just picked it up. 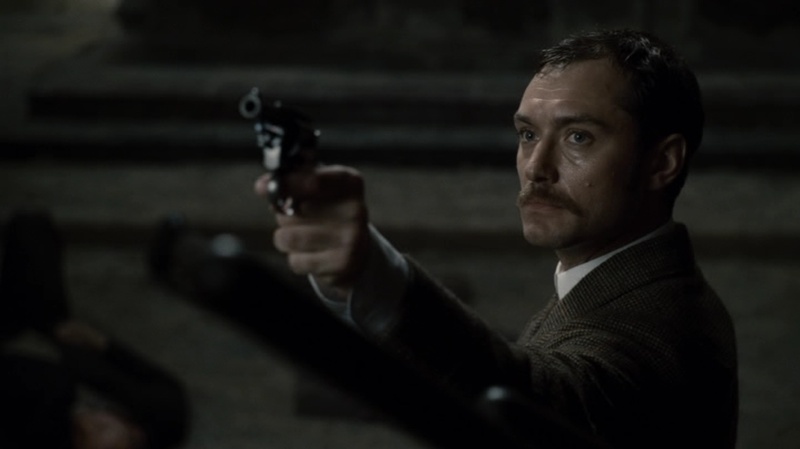 Dr. Watson: You remember your revolver? Sherlock: Oh, knew I forgot something. Thought I left the stove on. Sherlock: (re: the henchman) I think that’s quite enough. You are a doctor, after all. Sherlock: Always nice to see you, Watson. 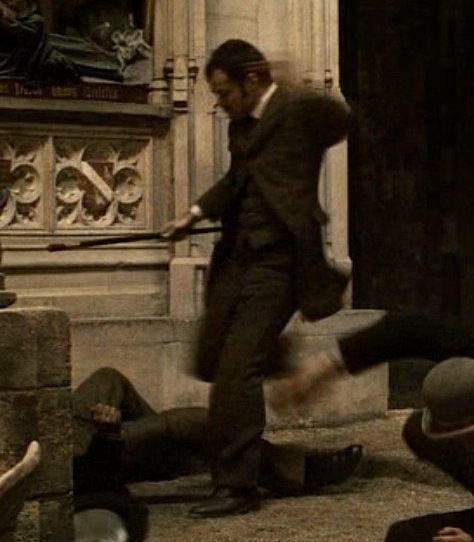 He and Holmes fight very ably, further enhanced by Hans Zimmer’s badass opening track “Discombobulate”. Watson carries his gun, a short-barreled Webley British Bulldog, likely a .442-caliber No. 3 “R.I.C.” model, in his left trouser pocket. Watson aims his Webley Bulldog at Lord Blackwood. It’s featured in the opening scene, but it gets plenty more use when he wears his brown herringbone suit later in the film. In fact, the rubber stunt Bulldog used by Watson in the sequel, Sherlock Holmes: A Game of Shadows, is available for sale at the Prop Store online if you’re willing to part with $1,119. Watson’s fine country suit counters Sherlock’s more Bohemian purple frock coat. Dress for your personality when venturing out to defeat a dark lord of black magic and ritual murder. Face it, you’ll need to dress for action. Sherlock: I managed it with braces, belts and a coat-hook. Please, Watson, my tongue is going, soon I’ll be of no use to you at all. Watson: Worse things could happen. Great write-up, again! I’ll have to re-read it. I’m always struck by film costume designers using such heavy fabrics. I realise that they want to stay true to the era, but I’m sure the actors must hate working under studio lighting, doing multiple takes with multiple layers on. Zimmer’s score for this film was a stand-out. I was playing it yesterday while ironing. Oh, one more thing- you’re gonna. Love “Sherlock” when you finally get your hands on it. Very clever modern take on Holmes, Watson, and their world. It is not a coachman’s hat he is wearing, rather a Cambridge Bowler… the same as Churchill wore on occasion, Odd Job had in “Goldfinger” and which John Steed occasionally wore in “The Avengers”.